Virgin Mobile has announced they will soon be selling a pay-as-you-go iPhone4 and iPhone 4S, offering contract free service starting at $20 per month, moving all the way up to $50 per month for unlimited talk and data. What's interesting about this is Virgin uses something called CDMA for channel access - that's the same technology used by Sprint and Verizon Wireless. And get this - Virgin is considered a virtual mobile network operator, purchasing network capacity from Sprint. This means when you use a Virgin phone, you're using the Sprint wireless network. Sprint service is just as good as AT&T or Verizon in my opinion. The latter two just do a lot more advertising to make us thing they are better. So, let's think about this, Virgin uses the same access technology as Sprint and Verizon and Virgin's a lot cheaper. You're also not locked into a 2 year contract. Hmmmmm......switching sounds like a no brainer. There is a catch though - Virgin is charging $650 for a iPhone 4S - full price. It's still cheaper though over the long run. 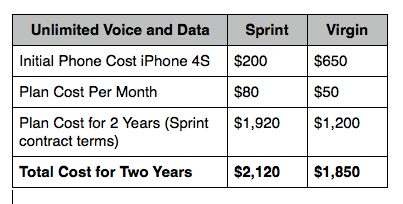 Let's compare Sprint's $80 per month unlimited data service (two year contract) to Virgin's $50 per month service (pay as you go). I have not included Verizon Wireless in the table because Verizon is eliminating the unlimited data plans. If you've recently bought a Verizon iPhone 4S though you could switch by unlocking (not recommending you do this but many have or are considering) it and switching over to the Virgin network. To break your Verizon contract you would have to pay around $600 which sounds like a lot but it may be worth crunching some numbers to compare total cost. If you've got an AT&T iPhone you're out of luck - it uses a different technology for channel access called GSM which is not CDMA compatible.